Minister for Defence Industry Christopher Pyne MP inspects components for the CEAFAR Phased Array Radar System from CEA Technologies. Left to right: John Teager AM, Managing Director, RUAG Australia; Urs Breitmeier, CEO RUAG Group, Chairman of the Group Executive Board; Stephan Jezler, Senior Vice President RUAG Aviation International; Christopher Pyne MP, Minister for Defence Industry. Image via CASG News. A Victorian headquartered company, with facilities in Queensland, NSW and South Australia, has been praised by Defence for its contribution to Australia’s defence industry capability. RUAG Australia has demonstrated its capability and contribution to large Defence projects across a range of weapons systems, including the global F-35 Program. 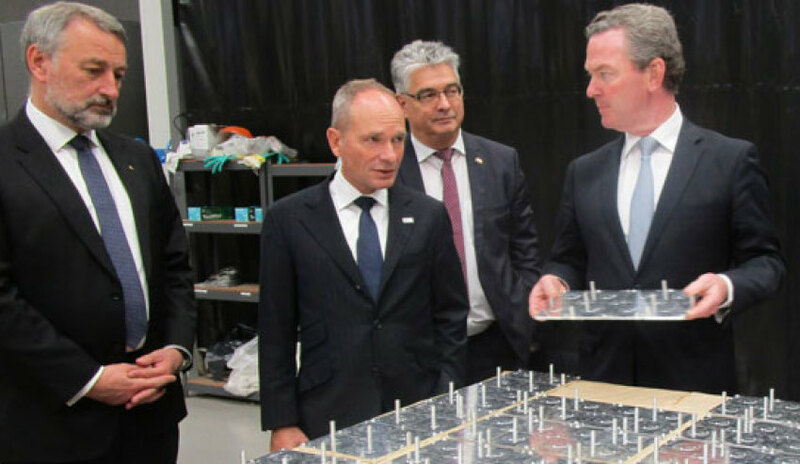 During a recent tour of RUAG Australia’s South Australian facility, Minister for Defence Industry Christopher Pyne said he is continually impressed at the standard of Australian defence industry capability. “RUAG Australia is currently contributing to a range of technologies including the manufacture of F-35 landing gear actuators, F-35 weapon bay door actuators and the special processing of F-35 vertical tail components," Minister Pyne told CASG News. "Australian industry is manufacturing parts that will be fitted to every F-35 in production globally. “I am impressed with RUAG Australia’s vision to expand their footprint in Australia as well as increasing opportunities for other companies to participate in RUAG Australia’s supply chains. “As a key strategic partner in the global F-35 Program, our goal is to ensure Australia is well positioned to gain more work in F-35 sustainment." RUAG Australia is one of the companies eligible to compete for F-35 component repair for the F-35 Global Support Solution. The company was successfully awarded the lead assignment for four technology groups in the initial F-35 regional sustainment assignments for components and also has multiple current contracts with the Australian Department of Defence for the maintenance of hydraulic and undercarriage pneumatic fuel and environmental control system components for the Hornet, Orion and Chinook fleets. “With long-term defence industry contracts directly employing more than 160 people at RUAG Australia, advanced Defence technologies is forging more opportunities for Australia," Minister Pyne said. "The building of Defence industry capability is an endeavour of national importance in delivering the capability Australia needs to counter future threats, while increasing economic benefit and jobs for the nation." RUAG Australia also has a major Defence export contract being the only Australian company contracted to provide maintenance support to the Royal Malaysian Air Force for their F-18 Hornet, C-130 Hercules, S-61 and engineering services. Headquartered in Bayswater, Melbourne, RUAG Australia also has facilities in Airport West in Victoria, RAAF Base Amberley in Queensland, RAAF Base Williamtown in NSW, and in Wingfield, SA.